There’s two ways to play with the Cat Dancer Compleat Cat Toy. 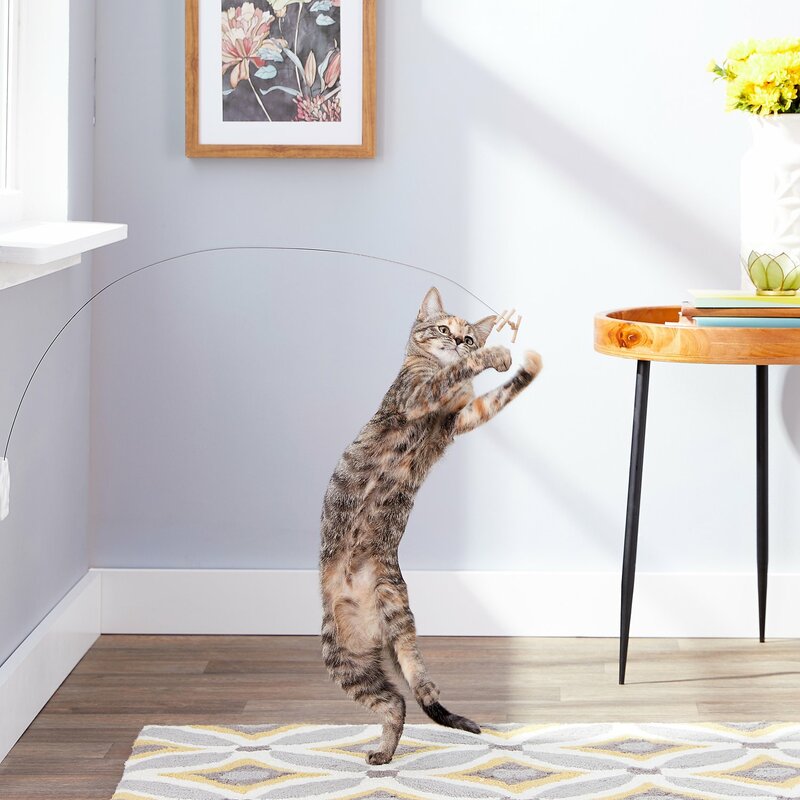 First, it works as a traditional cat wand, with spring steel wire and rolled cardboard that makes an irresistible lure for frisky kitties. Just a few flicks of the wrist, and your cat will start chasing, leaping and running in circles! 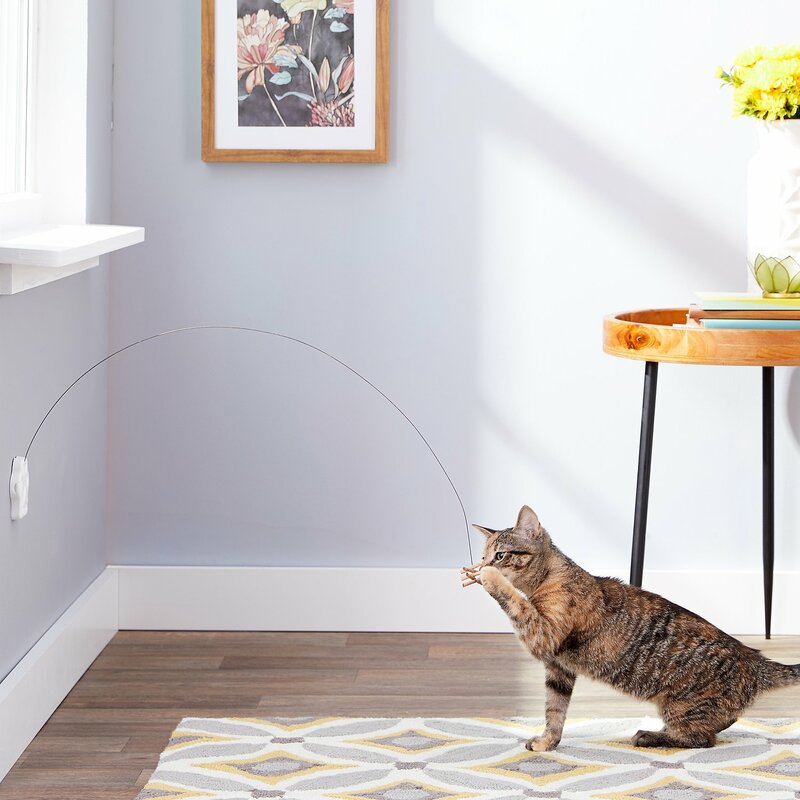 Or, you can mount it to the wall with the included adhesive paw, which allows your cat to engage independently—meaning when you’re away, the cat can still play! 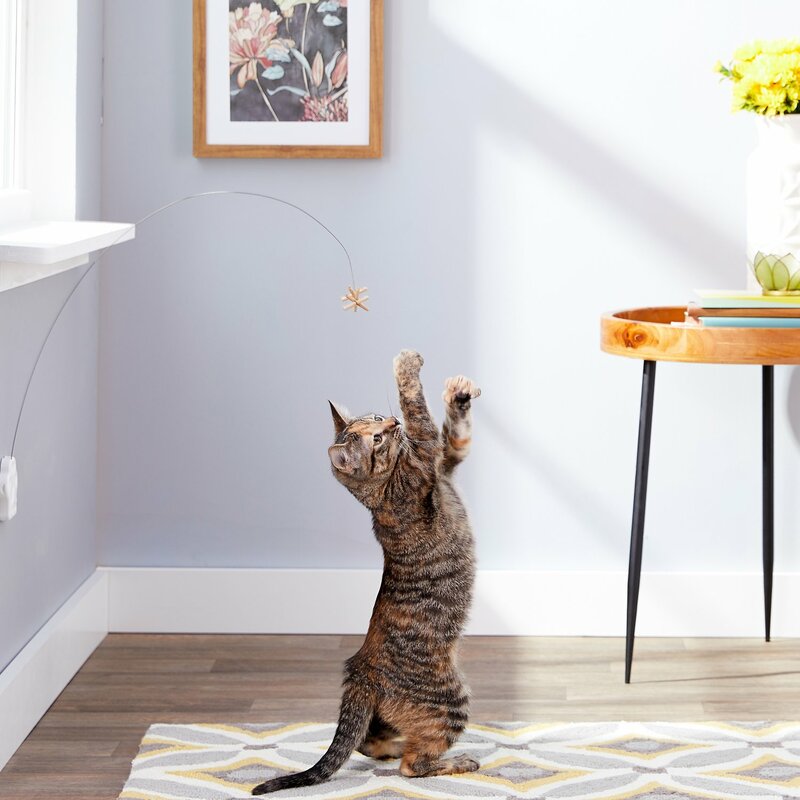 Functions as a traditional wand for interactive play with you and your cat. 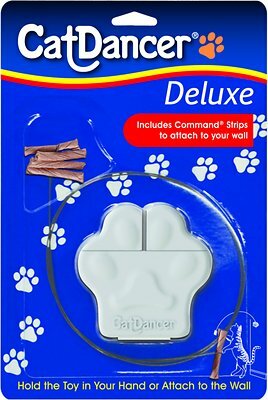 Can also mount to the wall with the included adhesive paw for independent play. Made of spring steel wire and rolled cardboard to create an irresistible lure. 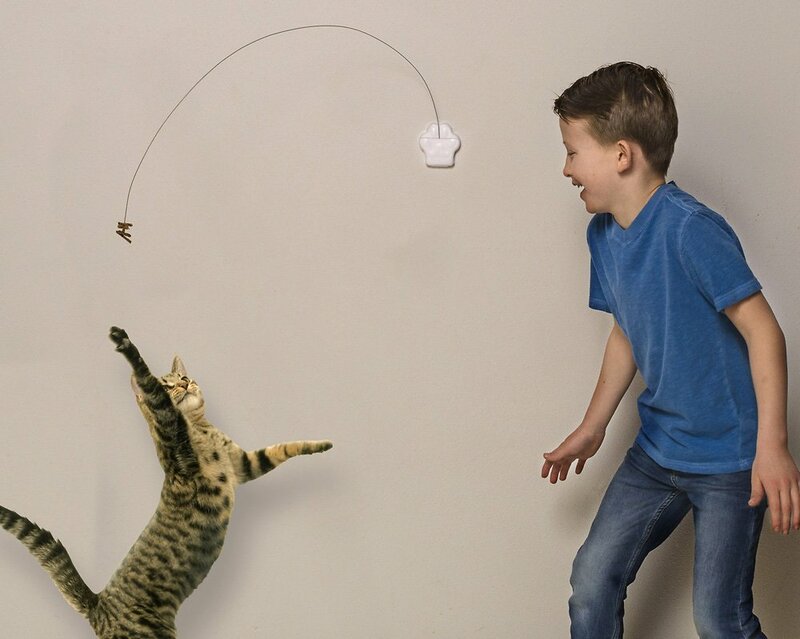 Home tested and approved by over 8 million cats; great for exercise and stimulation! Made in the USA at the solar-powered factory in Wisconsin. Hold the toy in your hand or attach to the wall. Who ever made this understands cats! I had something similar I just made myself, an it finally wore out and thought would see how my cats would like it. They love it even try to grab an drag into their play tunnels, and meow in excitement, I am definitely getting more of these so will be more spread out playtime, when one doesn't want to give it up or share. Lol.... So yes get this for your cats for their play area, they will love it! My Fluffy Cat only plays with one toy and it's the Cat Dancer. However, my arm gets too tired to play with him for as long as he wants. With the attachment he can entertain himself for hours! It's a cute design that sticks to the wall with commands stips so it doesnt damage the paint. Its awesome!!! By far my cats FAVORITE toy! She currently has 2 if these, just gave one away. Some mornings I wake up to find them both in bed with me right by my pillow! I personally like this wall mount one. Instead of mounting it on the wall I have found the the paw is easier to hold in my hand and control the toy! I think secretly it’s also my favorite toy!!! If you don't have this already, buy it! All of our cats are obsessed with this toy and play with it all day. It is very durable and even lasts with all of them pulling it every which way. So much fun to watch them play with it also. But forget about attaching it to a wall - the cat insists we are involved in all playing, so she is not interested when it's on the wall! Skip this and go for the original. My 20 pound former stray afraid of nothing kitty is totally scared of this! But my other two cats have had hours of fun with it so far! I’ve seen some reviews that say it doesn’t stay closed but I had no problem with that. The only thing is to be 100% sure that where you put it is really where you want it because it only sticks once. If you try and move it (like I did) it will not stick again. Overall great toy for hours of fun! Keeps my cat entertained all day! My 2 cats love the original but could play with it for longer than I could hold on to it. This had good reviews so I bought 2 The problem I had was when cats get aggressive with it the wire pops out of the holder so I had to use blue painting tape to tape down across wall. It was also not easy to get wire to fit into holder without alot of bending it around so holder would not pop open. Will just stick with original. Cute idea, but doesn't hold the interest of the cat for very long. Our cat was also interested in the cat paw that holds the wire we attached to the door.